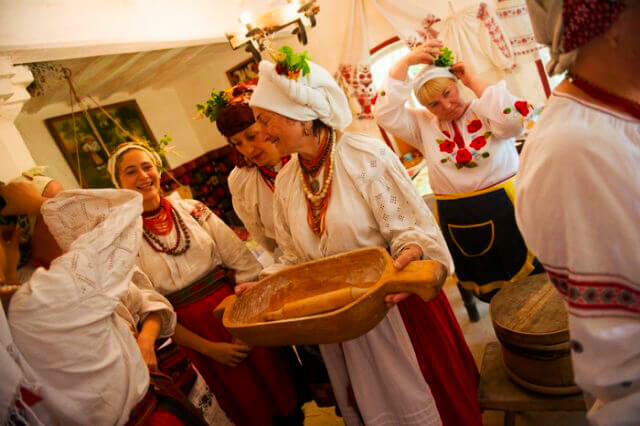 Wedding korovai is not only luscious pastry, but it is also the ritual bread with great symbolic meaning. Korovai is used to bless a new family life and is highly respected all over Ukraine. The entertaining and rich in events Ukrainian wedding ceremony can’t even be imagined without korovai. It starts and ends with the wedding bread. Embellished with diverse ornaments and figures, korovai symbolizes the union of two loving hearts. Its round shape is associated with the Sun that is worshiped by Slavic people. Researchers found that since the XI century no wedding celebration has taken place without the wedding bread in Rus’. Korovai was presented at lavish royal and princely weddings. In the XVI-XVII centuries, in Kievan Rus’ there was a tradition called "put on korovai" (“na korovai poklasty”) which meant to gift an engaged couple - guests and relatives gave the newlyweds presents in exchange for a piece of the wedding bread. According to Ukrainian wedding traditions, besides the main korovai, many other wedding bakery products were cooked for the wedding. Each of them was used in a long, interesting and engaging ritual Ukrainian wedding ceremony. The purpose of these loaves of bread was reflected in their specific names like “father, couple, lie-abed, twig, horns, wedding geese,” and more. However, korovai has remained the main traditional wedding symbol, and it is impossible to imagine main ritual actions without it. 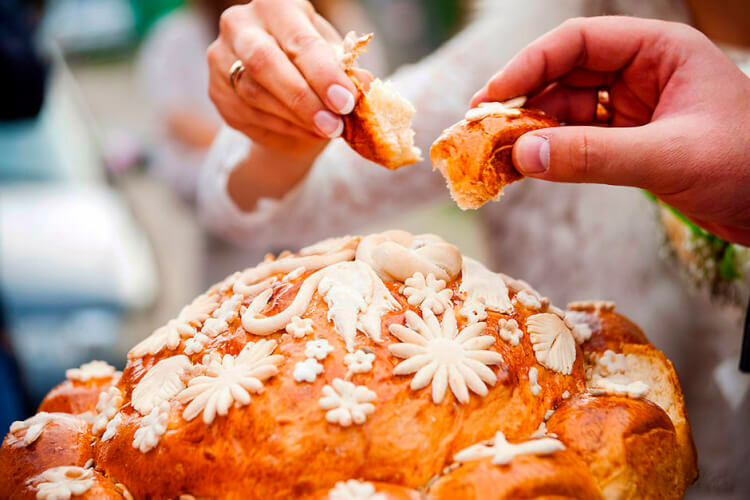 The wedding bread was used for such important actions as the blessing of the young couple, the connection of the members of both families into one, and many more. One of the most important wedding rituals was dough kneading which symbolized relatives’ blessing for the creation of a new family. Each action of cookies in the process of wedding bread kneading and baking had a symbolic and magic value. The wedding bread was cooked following ancient traditions, on certain days of the week. In the Eastern regions, korovai was baked in the bride's house. In Volhynia and Podilia the wedding bread was made in the house of relatives. In other regions, korovai could be baked either in the home of a bride or a groom. 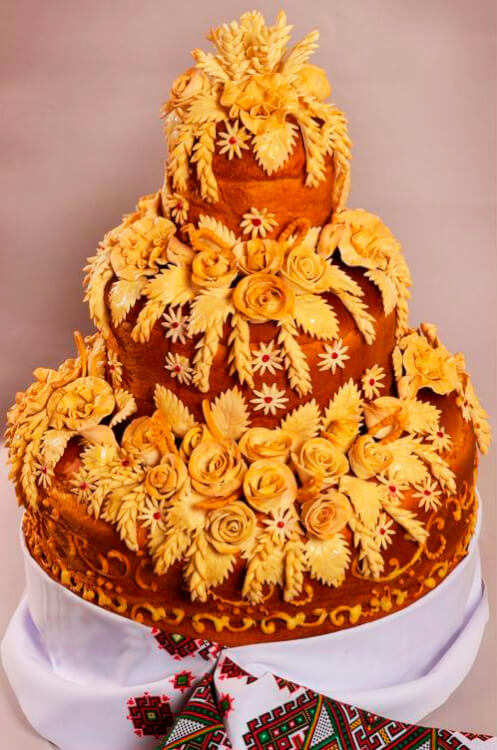 Usually, relatives from both the bride's side and the groom’s side took part in the baking process, thus demonstrating their desire to become related. 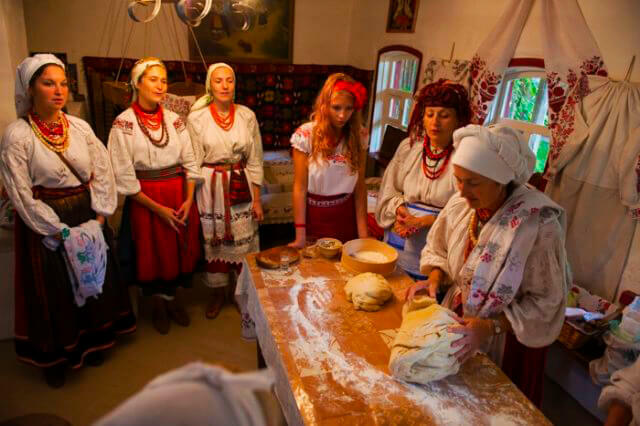 Only women who were in a successful, happy marriage and who can share their family happiness and well-being with the newly formed young family were honored to bake korovai. The friendly and collaborative work of cookies symbolized the unity and unbreakable bond of the future young family. Even the number of women mattered. In some regions, the odd number of cookies was considered a lucky one, especially if the number was seven. In other regions, the even number of women was invited to ensure a young couple will live in harmony for the whole life. Women who made the dough brought their own products – salo (pork lard), eggs, flour, etc. During the cooking process, women were bound with a special embroidered towel and their hands were washed with holy water. Cookies also sang folkloric wedding songs and prayed. After the dough raised, it was carefully placed in the hearth. Then the elder cookie took a bread spade and used it to knock on all four kitchen walls. The rest of the women took a barrel where the dough was kneaded and performed a ritual dance with it. While dancing they knocked on the ceiling with the barrel three times, as if showing how high and successful korovai should be. In Poltava region, there was a tradition to break the barrel where dough for the wedding bread was kneaded. It was believed that a successful korovai (high, puff, and evenly baked) brings happiness to family life. The higher the wedding bread rises and the more layers or decorations it has, the better the marriage will be. Yet a cracked or broken korovai is a bad sign for the marriage. It foretells difficulties for the engaged couple that may cause misunderstanding and even can lead to divorce. That is why cookies strived to use all their experience and skills to bake as good wedding bread as possible. 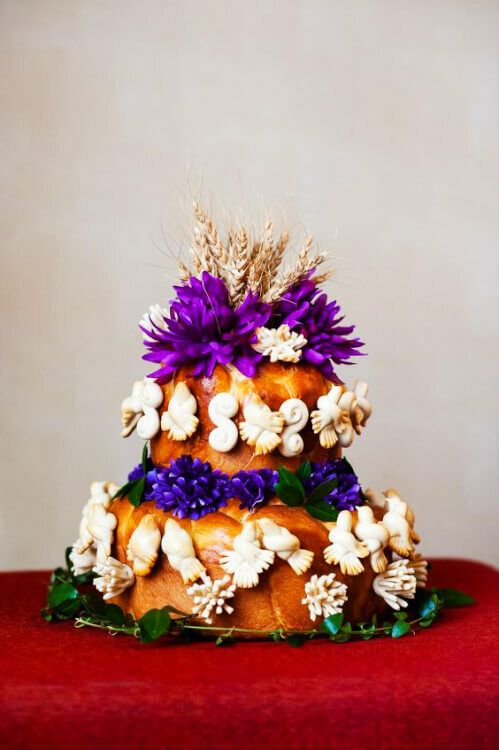 The wedding bread has a round shape and symbolizes powerful and mighty Sun. Particular attention was paid to the size of korovai. 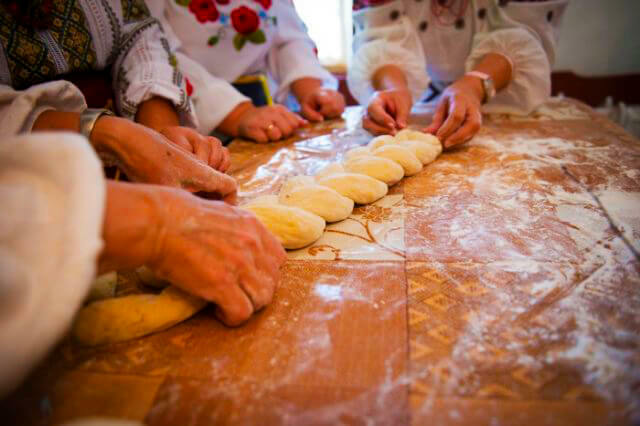 Ukrainian ancestors believed: “The bigger korovai is, the longer and happier the married life will be.” In some villages, there was a tradition to bake the wedding bread as big as a dinner table. So, three or even four strong men had to bring korovai to guests. 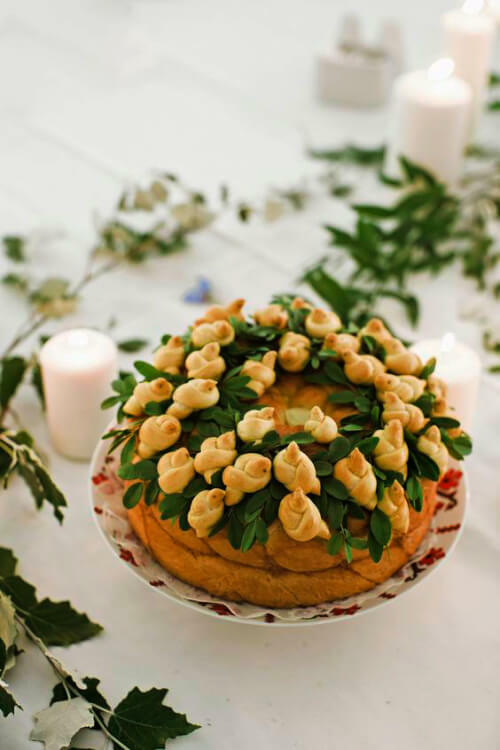 Traditionally, the wedding bread included two parts: the lower layer - the so-called "sole" or "bottom" that was made of rye or wheat flour and the top layer that presented a large round loaf of bread made of sweet dough (fancy pastry). 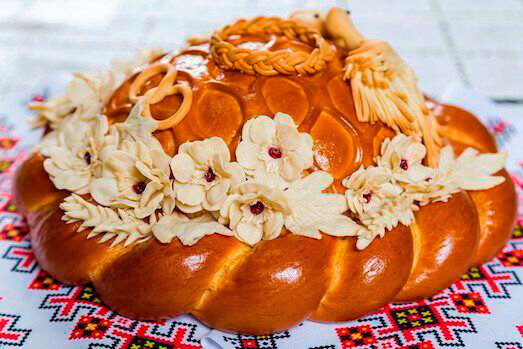 Traditional Ukrainian korovai was decorated with versatile flowers, leaves, guelder rose, birds, wheat spikelets, and herb ornaments made of unfermented dough (flour and water paste). Each decoration has a symbolic meaning. 1. Bunches of guilder rose berries are the attributes of love and mutual understanding. They are formed with the help of a confectionery syringe, arranging thin strips and balls one be one. If the dough is too tight for a syringe, you can “sculpture” bunches with your hands, just like you did in the childhood with plasticine. 2. Wheat spikelets symbolize prosperity. Make a thin strip out of dough, roll it off, make cuts from the sides with a not very sharp knife. Pull the edges slightly and the spikelets will become more fluffy. 3. Grapes mean financial well-being and fertility. The method of shaping is the same as with guelder rose branches. 4. Plaits are a special symbol signifying the union of a husband and wife. This item makes korovai lush and splendid. It is believed: the richer the plait, the more abundant life of the bride and groom will be. Roll out the dough and shape two strips, then interlace the strips. 5. Flowers and leaves are the additional elements to bunches of guilder rose berries and grapes. It is easy to make them: roll small cookies with your hand, spread and smooth them. Take a knife and cut out a flower or a leaf. Slightly pull the edges with your fingers to give the decoration a natural look. 6. Swan is a symbol of fidelity. On the wedding bread, any birds must be in a pair. This means a happy marital life. To make the bird, shape the oval out of the dough, then push the top end with your fingers - this will be a neck and a head. Wings and tail shape with hands, draw separate feathers with a knife. It is very important to decorate korovai only with “pair” symbols which are a very powerful sign for newlyweds, for instance, two birds near each other, interwoven branches or flowers, two rings side by side, the moon and the sun. This is a very powerful sign for newlyweds. Parents blessed the bride and groom with korovai before their marriage ceremony. Historically, the newlyweds were given the middle of korovai which was considered the happiest one, symbolizing prosperity and achievement of the wisdom of life. There is also a belief that those of the newlyweds who bites the biggest piece of bread will be the head of the family. The wedding bread was placed in the center of the festive table and served as a decoration of the feast, symbolizing welfare and fortune. At the end of the wedding, korovai was divided and given to all present – in such a way newlyweds shared their happiness with all their relatives and guests. 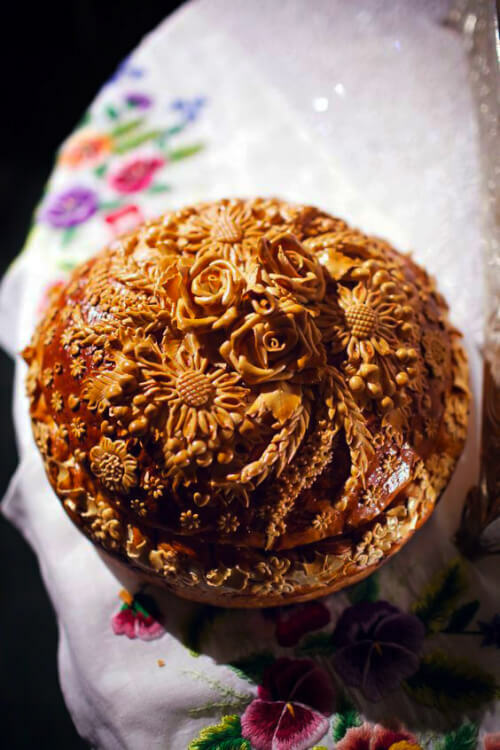 Decorations of the wedding bread were given to unmarried girls as a wish to find happiness in family life. It is interesting that the upper part of the wedding bread was shared among guests, while the band (musicians) that entertained guests took the bottom of korovai - that was their right. You should also know that in the Ukrainian tradition, the wedding bread is baked only once in human life. If one of the bridesmen is going to remarry, then korovai is not allowed to bake. If you’re ever invited to be a guest at a Ukrainian wedding, be sure to leave room for korovai. Because it a sign of disrespect if you refuse to take a bite when it is offered to you. Everyone has to eat a small piece. 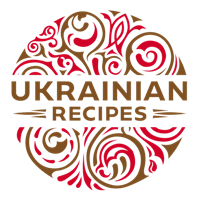 If you are overwhelmed with the beauty of Ukrainian korovai and would like to order one, there are many bakeries that provide them globally. 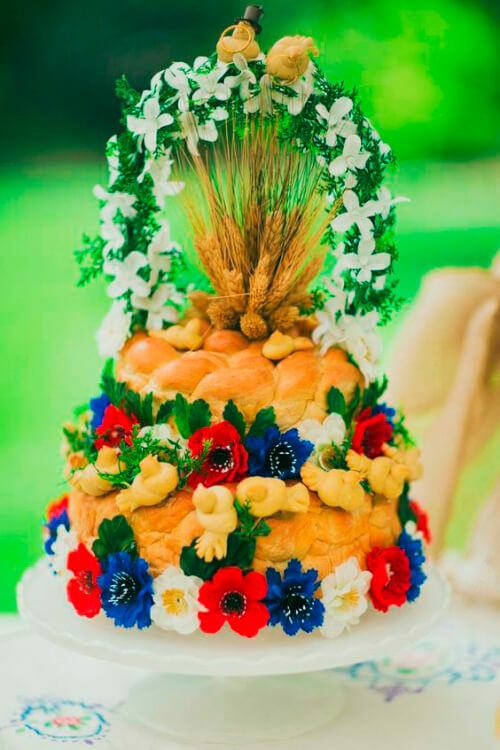 Have you liked the article about Ukrainian wedding bread?